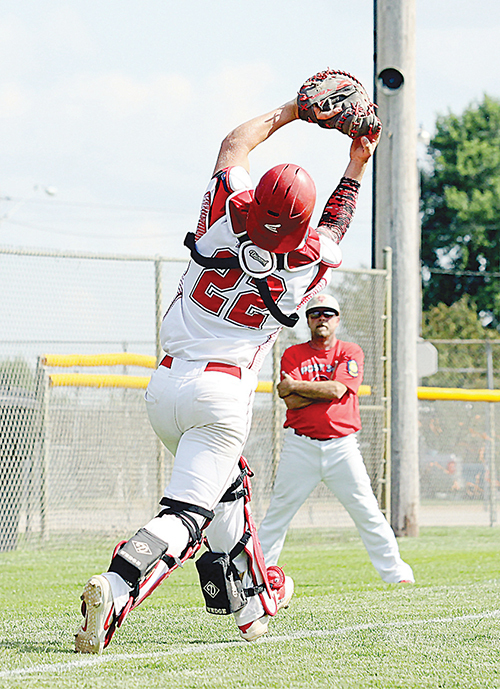 The Albion Cornerstone Juniors gave a valiant effort, but fell just shy of state tournament qualification in the American Legion Area 5 tournament at Palmer July 6-9. Cornerstone, seeded fourth in the five-team Area 5 field, blitzed #5 Doniphan-Trumbull 20-2 Friday to open tourney play. The game was effectively over after Albion sent 16 batters to the plate in the bottom of the first inning and took an 11-0 lead. Cornerstone ran into a buzzsaw in its second game of the tourney, as Stromsburg-Osceola-Shelby (SOS) blanked the Albion Juniors 10-0 in five innings. Cornerstone stranded Kramer (single) at third base in the top of the first inning, then failed to advance another runner past second in the contest, totaling just five hits against two SOS pitchers. SOS tallied twice in the first and three times in the second off Albion starter Carsten Bird, and boosted its lead to 7-0 in the third when Kramer came on in relief. Albion Cornerstone bounced back Sunday to top Utica-Beaver Crossing 6-1 behind Preister’s stellar pitching performance. The Cornerstone Juniors ended their Saturday scoring drought quickly with a pair of runs in the bottom of the first. Singles by Bird and Zoucha, sandwiched around Ethan Dozler’s walk, loaded the bases with one out. Bird then raced home on a passed ball and Webster plated Dozler with a two-out base hit. Albion added three runs with a two-out rally in the second. Kramer reached by error, Bird singled and Ethan Dozler walked to again load the bases. Kramer and Bird went home on another Utica-Beaver Crossing error and Webster drove in Dozler for his second RBI. That was more than Preister would need, as he limited Utica-Beaver Crossing to a single third-inning run, scattering seven hits, walking two and striking out seven. Bird and Kramer had much different results in their second pitching attempts against SOS, but Albion Cornerstone could not muster enough offense in a 2-1 elimination-game loss Monday night. Bird went 4 2/3 innings, allowing just single SOS runs – one earned – in the first and third innings. Kramer finished up with 1 1/3 scoreless frames, giving up a lone hit. SOS pitching was just a bit better, however, limiting Cornerstone batters to two hits and one run. The Albion Juniors got their only tally in the top of the third, tieing the game when Scott Wright was hit by a pitch, advanced on walks to Kramer and bird, and went hom on Dozler’s ground out. SOS then recorded the second out on a fly ball to right field and Kramer was tagged out attempting to steal home.